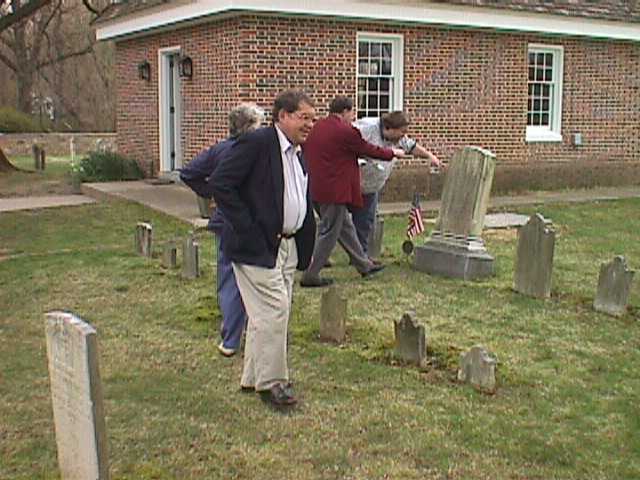 The Annual Meeting and Workshop was held on April 21, 2001, at the Cecil County Historical Society in Elkton, Maryland. The board members held their business meeting at 9:00 a.m. Immediately following the adjournment of the business meeting, Melvin Mason called the slate of officers. Barbara Sikora of Prince Georges County was re-elected as Secretary, George J. Horvath of Carroll County as Treasurer, and Paul Miller of Howard County continued on as a Director. At the conclusion of the elections, Barbara Sikora introduced the 2001 winners of the Periwinkle Awards. Jacqueline Hedberg’s ancestors, the Simmons, settled at Hoopers Island, near Cambridge, in the 1770’s. Although, she has no relatives living there now, she has recently undertaken with her husband James, the restoration of a family home, vacant for the past hundred years. Her personal interest in this restoration is what brought this history teacher to the cemetery business. She located a family cemetery of some 75 graves near the house. No one had been buried there since 1804 and although a local historian’s 1950’s inventory of the cemetery recorded numerous grave markers (including several wooden markers), few survived at the end of the twentieth century. In early 2000, Maryland’s Millennium Project was publicizing its grant program for restoration projects across the state. Mrs. Hedberg was told that the restoration of historic Old Hooper’s Island Cemetery was just the kind of project they were looking for. Last Spring, she began the first of what would ultimately be hundreds of hours of work on a grant application. The Dorchester County Government was supportive, the Daily Banner was running articles on the cemetery and the Hedbergs were busy gathering information to include in the application process. Yet, when the grants were announced in May, Old Hoopers Island Graveyard was not among the winners. However, once the Hedbergs had cataloged all kinds of data on the property and the families and the graves, they felt the next logical step would be a friends group. Jacqueline organized a volunteer cleanup and started a newsletter in December and James set up a web site. There are now over 100 Friends and enough money has been collected to do the initial survey of the cemetery and tackle the re-setting of stones. They have great plans for continued improvements. 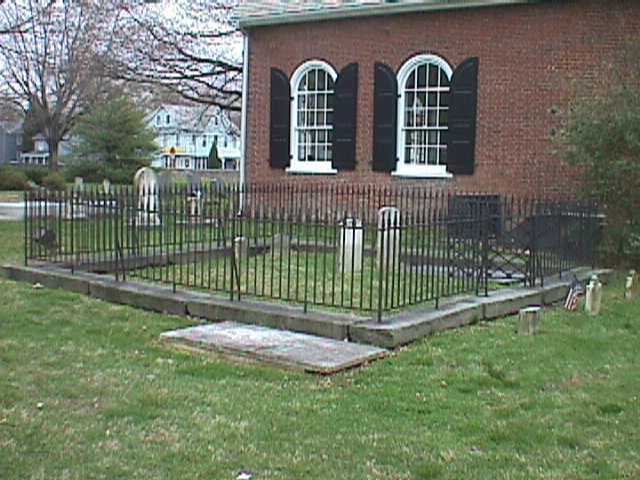 The Worthington family buried their dead on property in the modern Granite area. Marcella Chapel was an early Methodist Chapel established by the mother of Rezin Worthington in 1827 on an acre of the family plantation. The chapel has not been used since the 1890’s, but was once an important house of worship for the Worthington family, their slaves and members of the local congregation. A recently discovered document owned by the Methodist Church was determined to be a description of the first Methodist Church Sunday School Class in the United States – held at Marcella Chapel. The Worthington family graves and those of the Marcella parishioners are under threat of development by a modern day church, which is planning a large physical plant and seeks to lay a four lane access road through the chapel ruins and unmarked graves. After more than a year of legal skirmishes the conflict has reached a temporary hiatus. Adversarial parties appear to be regrouping. Mr. Dave Griffith has long been an erstwhile steward of the chapel and cemetery, letting people know of the existence of the site, researching the property and keeping its history alive. He has steadfastly supported this historic cemetery. The cemetery also has the support of two local heritage organizations. The Granite Historical Society whose current President is Mrs. Anna Anderson and the Greater Patapsco Community Association whose President is Paul Dorsey. Representatives of these organizations have offered testimony in legal settings and have been instrumental in publicizing the very real threat of this development. They have sought assistance from the Coalition and the State Highway Administration among others. Dr. Tatarewicz represented both the Board of the GPCA and the Board of the Historical Society at the presentation of the 2001 Perwinkle Award Ceremony. The first speaker of the day was Michael Dixon of the Cecil County Historical Society. His discussion focused on the history of the area and the graveyards that are found in and around the Elkton area. 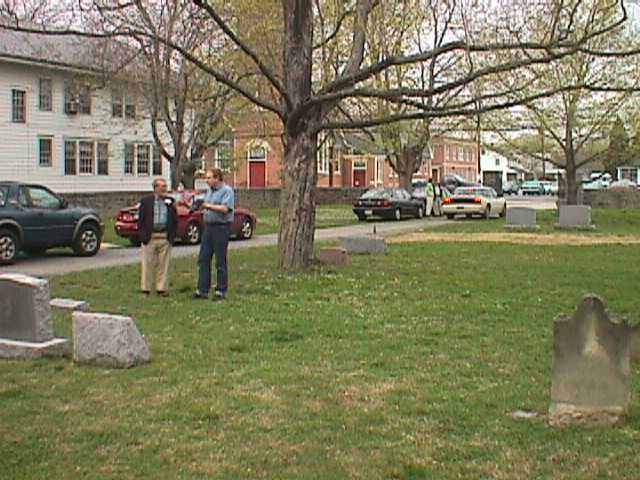 Angelike Kruger of the Association for Gravestone Studies followed Michael with a discussion of African-American Graves. The final speaker was Maryland Del. David Rudolph who discussed preservation legislation. During his discussion he provided many ideas to help guide the Coalition members to successfully lobby for introduction of legislation for the preservation of graveyards and cemeteries. 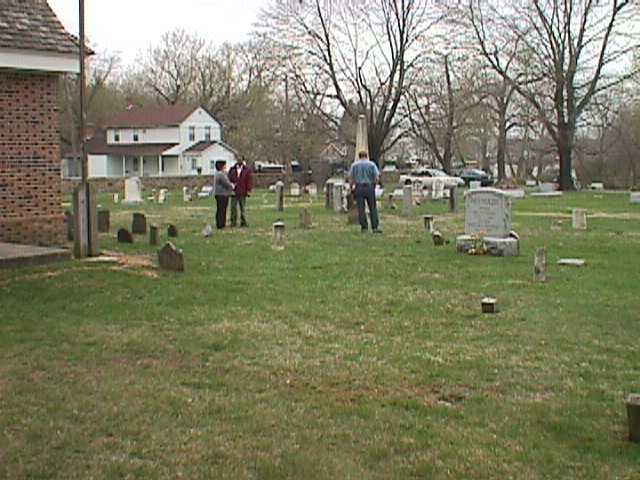 Following an open forum, participants visited St. Mary Anne’s Church and Graveyard in North East, Maryland. The members were provided an excellent introduction of the history of St. Mary Anne’s Church and the graveyard located on its grounds by a member of the congregation. After the informative talk, the members were encouraged to visit the graveyard and many spent some time wandering the grounds. 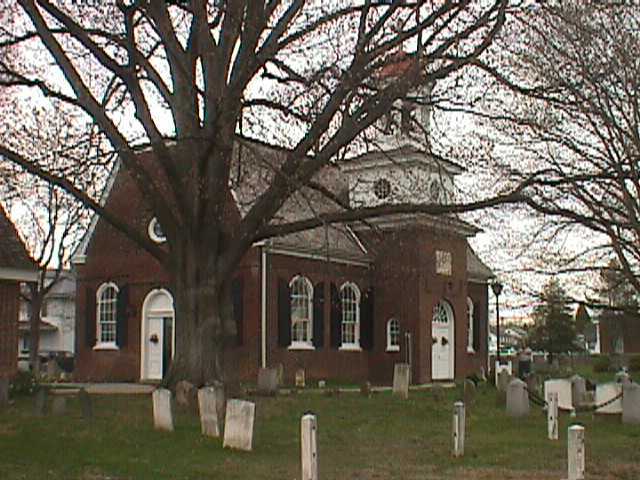 St. Mary Ann’s Church and Graveyard, North East, Maryland, April 21, 2001.